When it comes to sequester news, we've heard a lot about Senate Majority Leader Henry Reid (D-NV) and his tumultuous budget battles with Republican lawmakers. However, as the New York Times pointed out Tuesday, it's time to redirect your attention to a different powerhouse on Senate, Sen. Barbara Mikulski (D-MD). Mikulski is the chairwoman of the Senate Appropriations Committee and a firecracker of a personality. Here's why you should start following the senator, stat. She is the first female chair of the Senate Appropriations Committee and could be the one to prevent the looming government shutdown. The Senate Appropriations Committee is currently working to stop the first shutdown of the federal government after three years of narrowly avoiding it. If Congress is unable to reach an agreement on a government spending level by October 1, the government will run out of money. Right now, the two legislative chambers remain divided, with the House budget totalling $967 billion and the Senate budget using $1.058 trillion. If anyone can create an agreement, it's Mikulski — but with an austerity movement in Congress, an earmark ban, and the sharp divide between the two chambers, she's facing an upward battle. 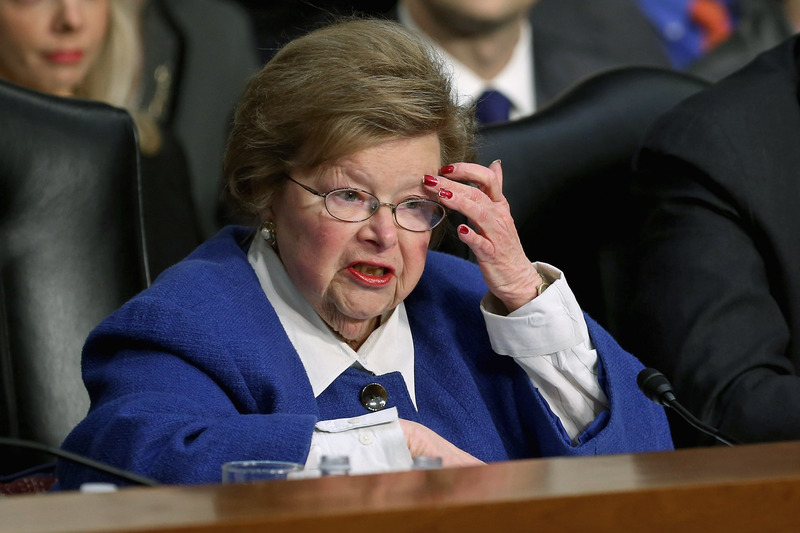 "The Republicans act like sequestration is the new normal," Mikulski has said. "I reject that it is." The Appropriations Committee isn't the only glass ceiling she's cracked, and she's helped other women advance, too. Back in 1992, a whopping seven female senators were elected to Senate, and the year was promptly labeled "The Year of the Woman." Mikulski responded with characteristic astuteness and cheek, saying the label, "makes it sound like the Year of the Caribou or the Year of the Asparagus. We’re not a fad, a fancy, or a year." She sticks it to the man. There is a saying in Senate on the three most recent Appropriations Committee chairs: "We loved Byrd, we respected Inouye, we fear Barbara," which references the late Senators Robert C. Byrd (D-WV) and Daniel K. Inouye (D-HI). Mikulski is known to be intimidating, but it's a reputation that comes from her demand for respect and accountability. Take, for example, one of the best Congressional anecdotes I've read, ever: During a March floor debate, Mikulski didn't feel Senator John McCain (R-AZ) was adequately informed to vote on a bill — so she ordered him to return to his office and read it. His response? McCain cheerfully agreed, saying, "I will now try to carry out my mission as assigned by the distinguished chairwoman." She's helping to fight military sexual assault. Mikulski announced Monday that language to create a Commission on the Selection, Retention and Quality of Service Academy Superintendents has been included in next fiscal year's Department of Defense Appropriations bill, saying that the fight against military sexual assault needs to be fought in the institutions that train future leaders. Smart lady, important issue.